"ENSO" refers to the El Niño/Southern Oscillation, the cycle of warming and cooling events that take place over roughly 2-7 year intervals over the equatorial Pacific Ocean and the atmosphere above it. This year-to-year or multi-year variability in oceanic and atmospheric conditions has far-reaching impacts, called "teleconnections", on seasonal precipitation and temperature patterns in many areas of the globe. This Map Room includes maps and analyses useful for monitoring ENSO, understanding the impacts and learning about key scientific advancements that have led to our current level of knowledge. This section contains links to ENSO related bulletins from the IRI and external sources. 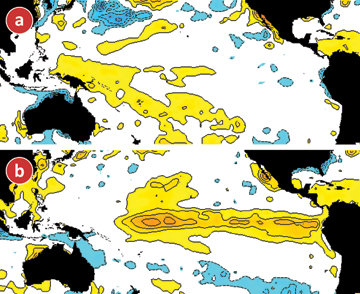 This section contains maps, time series and other analyses useful for monitoring ENSO and identifying the presence of a shift into El Niño or La Niña. This Section contains explanations for ENSO, El Niño and La Niña as well as a historical account of ENSO related research conducted over the past 120 years. This section contains tools that help explore the historical relationship between ENSO and regional climate.